A window is an opening in a wall, door, roof or vehicle that allows the passage of light, sound, and/or air. Modern windows are usually glazed or covered in some other transparent or translucent material, a sash set in a frame in the opening; the sash and frame are also referred to as a window. Many glazed windows may be opened, to allow ventilation, or closed, to exclude inclement weather. 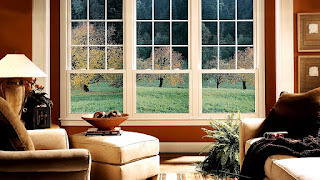 Windows often have a latch or similar mechanism to lock the window shut or to hold it open by various amounts. The English language-word window originates from the Old Norse 'vindauga', from 'vindr - wind' and 'auga - eye', i.e., wind eye. In Norwegian Nynorsk and Icelandic the Old Norse form has survived to this day (in Icelandic only as a less used synonym to gluggi), in Swedish the word vindöga remains as a term for a hole through the roof of a hut, and in the Danish language 'vindue' and Norwegian Bokmål 'vindu', the direct link to 'eye' is lost, just like for 'window'. The Danish (but not the Bokmål) word is pronounced fairly similarly to window. In the 13th century BC, the earliest windows were unglazed openings in a roof to admit light during the day. Later, windows were covered with animal hide, cloth, or wood. Shutters that could be opened and closed came next. Over time, windows were built that both protected the inhabitants from the elements and transmitted light, using multiple small pieces of translucent material, such as flattened pieces of translucent animal horn, thin slices of marble, for example fengite, or pieces of glass, set in frameworks of wood, iron or lead. In the Far East, paper was used to fill windows. The Romans were the first known to use glass for windows, a technology likely first produced in Roman Egypt. Namely, in Alexandria ca. 100 AD cast glass windows, albeit with poor optical properties, began to appear, but these were small thick productions, little more than blown glass jars (cylindrical shapes) flattened out into sheets with circular striation patterns throughout. It would be over a millennium before a window glass became transparent enough to see through clearly, as we think of it now. A fixed window is a window that cannot be opened, whose function is limited to allowing light to enter (unlike an unfixed window, which can open and close). Clerestory windows in church architecture are often fixed. Transom windows may be fixed or operable. This type of window is used in situations where light or vision alone is needed as no ventilation is possible windows without the use of trickle vents or overglass vents. Double-hung sash windows were traditionally often fitted with shutters. Sash windows can be fitted with simplex hinges that let the window be locked into hinges on one side, while the rope on the other side is detached--so the window can be opened for fire escape or cleaning. An alternative method is to calculate an optimum window mounting angle that accounts for summer sun load minimization, with consideration of actual latitude of the building. This process has been implemented, for example, in the Dakin Building in Brisbane, California--in which most of the fenestration is designed to reflect summer heat load and help prevent summer interior over-illumination and glare, by canting windows to nearly a 45 degree angle. Passive solar windows allow light and solar energy into a building while minimizing air leakage and heat loss. Properly positioning these windows in relation to sun, wind, and landscape--while properly shading them to limit excess heat gain in summer and shoulder seasons, and providing thermal mass to absorb energy during the day and release it when temperatures cool at night--increases comfort and energy efficiency. Properly designed in climates with adequate solar gain, these can even be a building's primary heating system.